Brooks, Joan. Spring 1978. Maine: Aurora / Amherst. 12 pp. Tape: 1 1/2 hrs w/ brief cat. 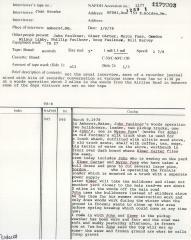 Comments on woods operation run by John D. Faulkner, lunch conversation with crew, work sounds.